The National Native Title Tribunal (NNTT) has recently made a very important decision for the Wajarri Yamatji people. The NNTT ruled that four mining tenements in the Weld Range cannot be granted because of the cultural significance of the area to the Wajarri Yamatji people. This is only the second time that the NNTT has ever made such a decision, and it comes after parts of the Weld Range were accepted on to the National Heritage List earlier this year. Weld Range Metals, the company that wished to mine the area, has been reluctant to meet with the Wajarri Yamatji people and did not come to agreement over the proposed mining project. This is a fantastic result for the Wajarri Yamatji people and YMAC congratulates them for their strength in fighting to protect their cultural heritage. Zac James, Shakira Clanton and Ian Wilkes. Perth-based Indigenous theatre company Yirra Yaakin is coming to the Pilbara this week to present Good Lovin’, an original commission by the WA Health Department, written by Palyku playwright David Milroy. 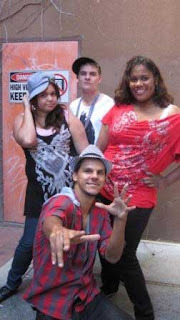 The play will be presented for free to schools and communities in the Pilbara region from 20-23 September 2011. David Milroy is an award-winning playwright (Waltzing the Wilarra, Windmill Baby), and has written Good Lovin’ to promote positive lifestyle choices. The Good Lovin’ performance will be followed by a theatre and health workshop to encourage and support young people to make choices about what’s right for them by using hip hop and humour. The performance and workshop program of Good Lovin’ will visit schools and local communities in Karratha on 20 September, Roebourne on 22 September, and Onslow on 23 September. 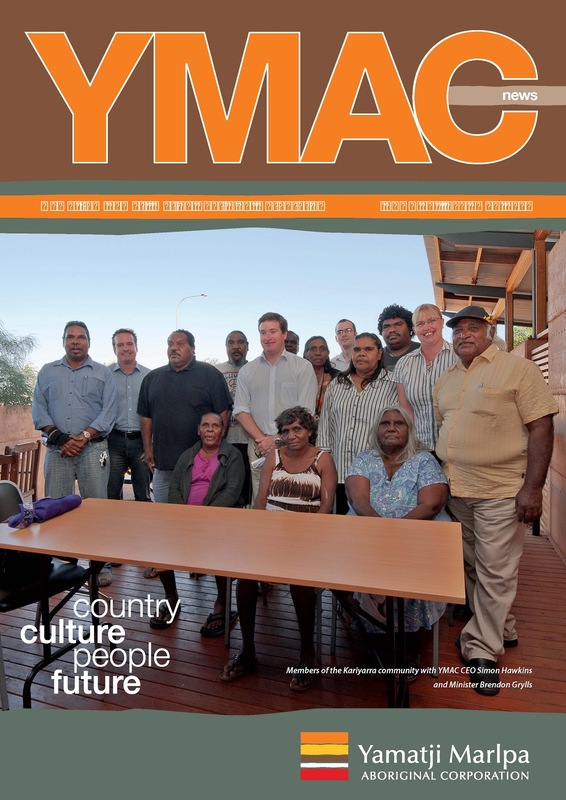 YMAC is pleased to share the latest issue of YMAC News, which is now available It is filled with information about the great work being done by traditional owners and YMAC staff across the two YMAC regions. 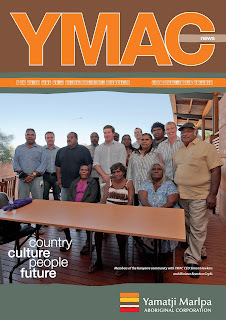 Issue 15 of our newsletter highlights native title agreements for the Kariyarra and Gnulli people, a major step forward for the Bunjima people, some impressive achievements by YMAC staff and our organisation’s firm resolve on the issue of constitutional recognition for Australia’s original inhabitants. We hope you enjoy the 15th issue of YMAC News. Click here to download an electronic version or email srosenfeld@ymac.org.au to request hard copies for yourself, your family, your business or workplace. YMAC is pleased to learn that huge pieces of Aboriginal artwork have been comissioned for the new Fiona Stanley Hospital in Perth. Aboriginal artists Ella Taylor (Kidja Heritage), Wendy Hayden (Nyoongar Heritage) and Deborah Bonar (Gija and Yamatji) have developed the sixteen metres of artwork on glass and a huge canvas in colaboration with the owner of the Kidogo Institute of Art, Joanna Robertson. The artwork features representations of each of the five main regions of WA. “We wanted Aboriginal patients and visitors from anywhere in Australia to feel more comfortable when they come to the hospital,” explained Deborah Bonar. Ms. Bonar has also been selected by the Revealed ArtWorker Program as one of three artists who will curate the art exhibition during CHOGM. The Fiona Stanley Hospital is due to open in 2014, and the Welcome to Country artwork will acknowledge the Traditional Owners and celebrate the rich cultural heritage of WA’s Indigenous people. This week, Nyaparu Rose featured in the North West Telegraph and The West online where she discussed her recent State Land Care Award for the Pilbara Sea Country Project and her plans for Nyangumarta self determination. Our street address remains the same. Please update your records accordingly.